If you spent some part of your childhood wishing you could run with wild horses, you’re not alone. But you might have been alone once you joined the herd. 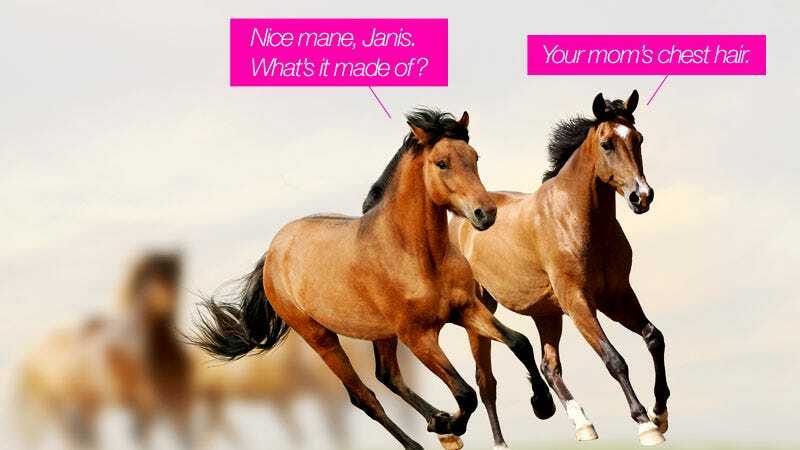 Horses, it turns out, are just as cliquey as fifth-grade girls. Horses are all over YA literature, using their soulful eyes to connect deeply with kids and other humans. They gallop through the Saddle Club series, War Horse, and My Friend Flicka—all the way back to Black Beauty, which got a jump on the genre in 1877. Some of the protagonists of horse books are boys, but girls are always the famous horse lovers, whether they prefer the fictional or ride-able kind. Despite all these horsey societies running around, scientists have mostly studied the animals as they relate to humans. Briard is more interested in how horses make group decisions. “Are you equally influenced by all the members of your group, or do your friends have more impact on your decision?” she says. So, to figure it out, Briard and her colleagues have been spying on horses. For a recent study, they spent 200 hours observing three dozen mares living on a hilly pasture in eastern France. They recorded all the horses’ friendly interactions (standing next to each other), unfriendly interactions (biting, kicking), and movements (“Let’s be under that tree now”). The scientists also assessed each horse’s personality. “Soulful gaze” wasn’t one of the traits they studied. But they did measure gregariousness: how much time did the horse spend standing near others? They also looked at fearfulness: how often did the horse shy or get startled? They saw that the friendliest horses were also the most fearful. It sounds counterintuitive, but Briard says you can see the same effect in sheep, fish, and birds. “The more fearful you are, the more time you spend close to other individuals,” she says. In other words, horses that hang out by themselves are braver. If your inner preteen loner wants to feel smug about this, let her. To Briard’s surprise, the horses were also very particular about their friends. They preferred to spend time near others with similar personalities. Not only that, but horses stuck close to others with a similar social rank. Deciphering the social hierarchy of the herd wasn’t as simple as seeing which mares had the nicest hair. But the researchers figured it out by watching which horses ran away when others approached them aggressively. Higher-ranking horses also tended to be older. Bold horses—the less friendly, braver mares—were more likely to break away from the group and head for a new patch of grass. Whenever a horse struck out like this, her friends (however uncool) were among the first to follow her. So a pasture of horses isn’t the paradise you might have imagined. In fact it looks a lot like a school cafeteria. There are cliques, fights, and tacit understandings of status. Why do female horses hang out with others who match their rank and personality? Why not build a diverse friend group? Briard says there are two possible explanations. One is conformity. This means the same thing in animals as in people: we change ourselves to fit in. Scientists have seen conformity in types of birds and even spiders. In humans it protects us from social discomfort; blending in can also make an animal less conspicuous to predators. The other explanation is “homophily,” or loving what’s similar to us. Rather than becoming more like those we spend time with, we seek out a group that’s like us from the beginning. Scientists have seen this effect in many animals including chimpanzees, baboons, and—of course—humans. Comparing the social tribulations of horses and schoolgirls is “not so silly,” Briard says. But she points out that navigating mean-girl politics isn’t just part of growing up as a girl. It’s key to life as a social animal. “We, like horses, live in societies and have to interact on a daily basis with the same individuals,” she says. So we face the same challenges horses do: avoid conflict, make friends, reach consensus. Higher-ranking friends can protect us from harm, but can also take advantage of us. It’s crucial to stay in the group, Briard says, but “without losing sight of your own interest.” Sounds like the plot of a YA book. Elizabeth Preston is a science writer in Massachusetts. Her blog, Inkfish, is published by Discover. Follow her on Twitter @Inkfish.